(my father John W. Bruce’s first cousin) turned 105 years young! amidst a grove of beautiful trees at the foothills of an awe-inspiring volcano. When she was 99 (2004-2005), i stayed at her home and convalesced from a severe foot injury. She brought me tea, shared her sweet kitty, looked after me and watched late night television with me. Please read the following article on what she thought about turning 100! i was happy to find the article i remembered reading a few years ago about Phyllis posted in an online blog called The Time Machine Radio Show in 2006. It originally appeared in THE LAHAINA NEWS. 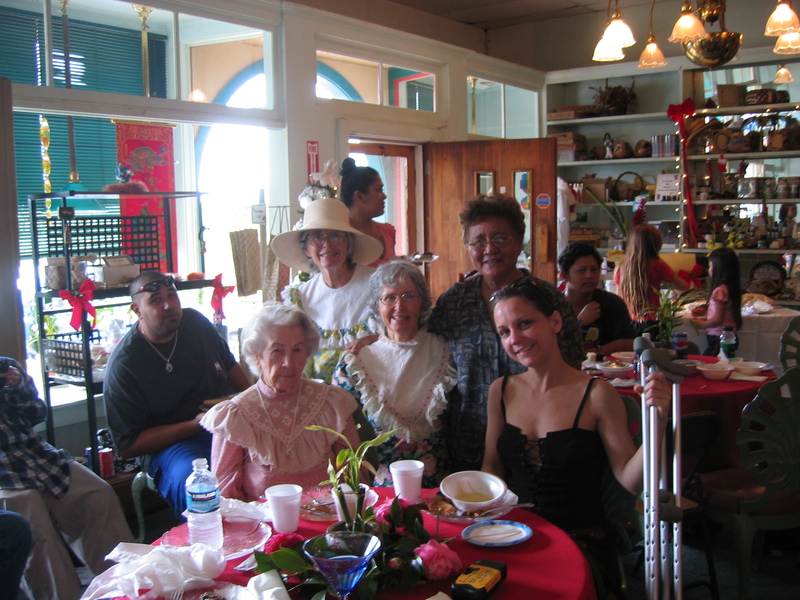 (2006) LAHAINA – Phyllis Carr Bruce is still as witty now as she was 80 years ago. The former Lahainaluna High School teacher is reaching her 101st birthday this August. But her mischievous eyes reveal a much younger, much less innocent girl. Her daughters, Lesley and Phyllis Jean Bruce, laughed along. Born in 1905, Bruce was raised in McVille, North Dakota. Her father farmed and her mother was a teacher. She remembers traveling 12 hours by a horse drawn buggy with her parents and four siblings. By 1915, Bruce already knew she wanted to come to Hawaii. Her father had taken her to the International Exposition in San Francisco and she was enchanted by Kumalae’s ukulele exhibition. In fact, her father bought her a Kumalae ukulele from Sears and Roebuck. Bruce still has it. She received her Bachelor of Arts in Home Economics from the University of North Dakota by age 21 and then taught for two years in Moose Lake, Minnesota. Bruce also studied golf and folk dance classes at the University of Chicago. “I took some very hard courses,” she winked. In 1928 it was off to Maui. Armed with her strong character and letters of recommendation that boasted her teaching abilities, she made the trip alone. It wasn’t easy, and it took days of traveling. 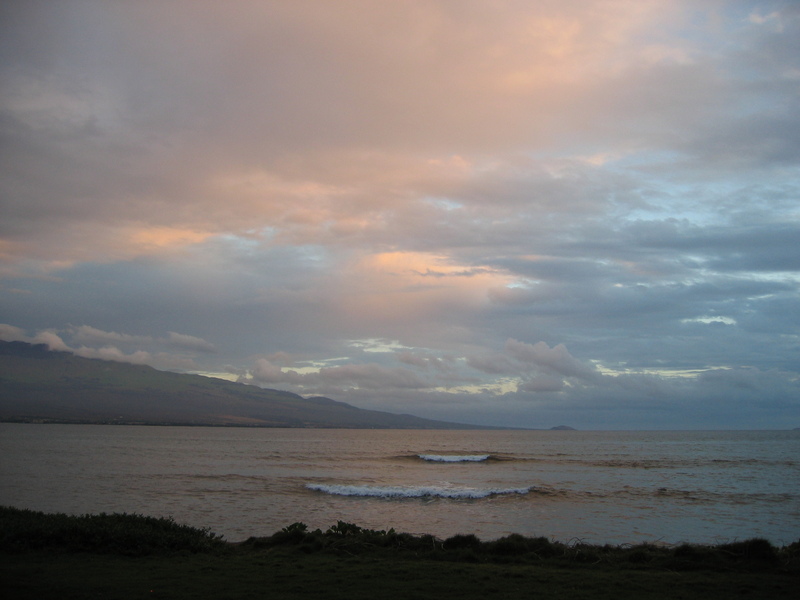 When Bruce arrived in Lahaina, it was night and she was all alone. She went to the Pioneer Inn. Lahainaluna was hiring at that moment and Bruce landed her teaching position. She taught home economics, general science and biology and coached the basketball team. H. Alton Rogers was the principal at the time and he ruled the school with a strict hand. Bruce lived on the campus for one year until she moved in with Mary Couch, the principal at King Kamehameha III Elementary School. While most teachers earned ten cents to one dollar per day, Bruce was earning $5. One year later, the Great Depression hit the Mainland and Bruce was sending money to help her family. But even that didn’t tame her spirits. She still went out and enjoyed herself. She recalled an incident when Principal Rogers “fired” her for a day. “I had come back from Honolulu,” she said nonchalantly. “I had car trouble – it rained buckets and wouldn’t start. I got to my campus just in time for my class. It was second period. [Rogers] said, ’You’re excused for the day.’ So I said thank you and went down to Lahaina and we gallivanted!” she declared with a proud smile. 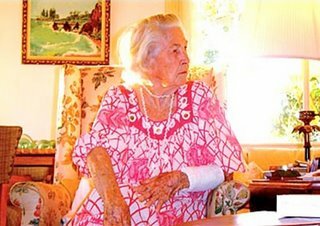 She recalled going swimming every day after school at the Cliff House in Kapalua. Bruce rode a horse up Haleakala and stayed overnight in a small shack that had open doors and windows, so all the air came in, because according to her, “there was nothing else to do,” wink. Her easygoing attitude is still prevalent. She takes everything in stride and makes a joke out of it. I think tea with this woman would lead to some of the most wonderful stories to hear! Thank you for sharing your grandcousin with us, Sarah. 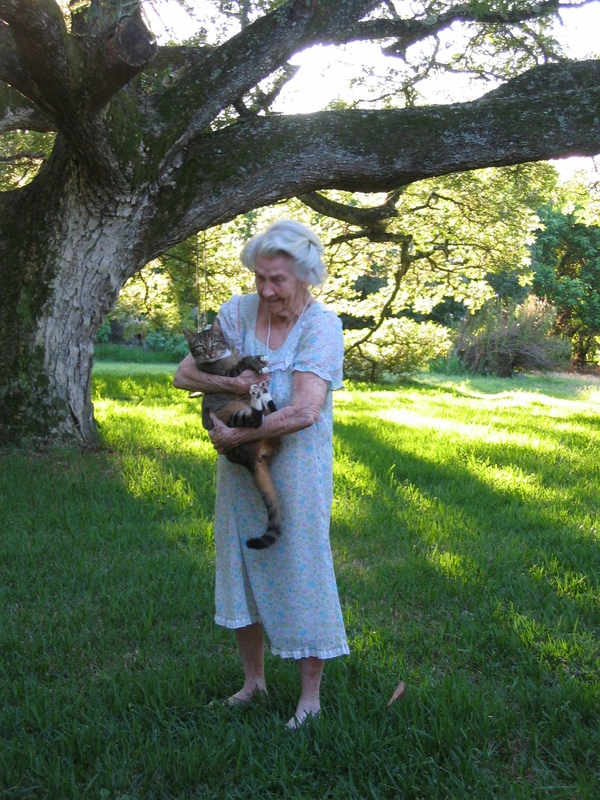 I adore the photo you took of her holding the cat. The composition is lovely, and that cat appears to be very contented ..so precious! 23rd August & Officially Grand Cousin Phyllis (aka Baba) is 105! I was Fred’s college roomate. I met Phyllis several times over the years. She was a wonderful lady. Spicy and fun. I spent a few nights in her house in the early 1980’s. We were sorry to hear of her passing. I very much enjoyed your blog post!